It’s hard working in the road and waterworks sector. As an employer, the health and safety of your workforce is extremely important. But how do you know exactly what your people need? HAVEP’s specialised AVAG-advisors love to help you forward. They think along with you about subjects like good visibility and working under various weather conditions. Let yourself be advised about the different options and go for work clothing in which can be worked hard in a thought-out way. 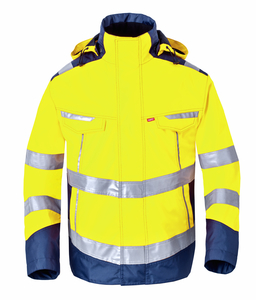 The work wear and safety clothing of Havep complies with the latest ISO and EN standards. Several large pockets for extra storage posibilities. The marine fabric is placed where the clothing is most exposed to dirt. Waterproof, windpro of and breathable workwear (EN 343). Anorak can be complemented with fleece vest 50219 or 50220. Perfect fit, available in the usual lengths.